Asthma pathogenesis and susceptibility involves a complex interplay between genetic and environmental factors. Their interaction modulates the airway inflammation and remodelling processes that are present even in mild asthma and governs the appearance and severity of symptoms of airway hyperresponsiveness. While asthma is felt to develop as the result of interaction among many different genes and signalling pathways, only a few genes have been linked to an increased risk of developing this condition. We report the results of expression microarray studies using tissue obtained from bronchial biopsies of healthy controls and of subjects with allergic asthma, both before and following inhaled corticotherapy. We identified 79 genes that show significant differences in expression (following Bonferroni cutoff using p < 6.6 × 10-6 to correct for multiple testing) in asthmatics compared to controls at significance levels. These included 21 genes previously implicated in asthma, such as NOS2A and GPX3, as well as new potential candidates, such as ALOX15, CTSC and CX3CR1. The expression levels of one third of these transcripts were partially or completely corrected following inhaled corticosteroid therapy. The study shows that bronchial biopsies obtained from healthy and asthmatic subjects display distinct expression profiles. These differences provide a global view of physiopathologic processes active in the asthmatic lung and may provide invaluable help to clarify the natural history of asthma. Asthma is a heterogeneous disease with variable clinical presentations. Genetic and environmental factors likely play a significant role in its pathogenesis, by modulating the airway inflammation and remodeling processes. Asthma airway inflammation and remodeling are characterized by lymphocyte and eosinophil infiltration of the bronchial mucosa and are accompanied by structural changes including epithelial desquamation, subepithelial fibrosis, mucus gland hyperplasia, modification of the extracellular matrix and hypertrophy/hyperplasia of smooth muscle cells [1, 2]. Both processes involve inflammatory and structural cells and likely play an important part in determining the development, chronicity and severity of asthma in individual patients. Despite many association and linkage studies, most asthma-related genetic susceptibility factors and subphenotypes have yet to be established. With previous technologies, few candidate genes have been identified and confirmed in different populations. These difficulties highlight the importance of combining various approaches to increase our knowledge on the many pathways that are affected during the pathogenesis of asthma and possibly increase the likelihood of identifying asthma-related genes harboring sequence variants that predispose or modulate asthma and atopy. Large-scale gene expression profiling with microarrays provide opportunities to investigate a large number of genes that may be implicated in the physiopathological processes occurring in asthma. Within the last two years, several studies have reported results of microarray experiments comparing peripheral blood cells of asthmatic and allergic subjects as well as lung tissue obtained from animal models or allergic airways disease [3–11]. For instance, in comparison to control subjects, peripheral blood cells of asthmatics demonstrated modified expression of a variety of cytokines (including IL-6, IL-8, IL-10, IL-12, IFN-γ, IFN-α), [4, 5]. Another study, demonstrated different gene expression profiles including increased expression of STAT6, IL-4, IL-13 in allergen-stimulated Th2 cells . Treatment of peripheral eosinophils with IL-5 upregulated 73 genes; of these genes, many known to play a role in adhesion, migration or activation of eosinophils . In a monkey model of allergic asthma, cluster analysis of microarray data revealed five groups of genes with unique expression patterns [10, 11]. One group included genes for several chemokines (eotaxin, MCP-1, MCP-3, etc.) as well as genes involved in tissue remodeling and antioxidant responses [10, 11]. Recently, Zimmermann and coworkers have described a pathway involving arginine metabolism in the context of allergic inflammation in mouse models studied using expression microarrays . Such gene expression profile studies have demonstrated the usefulness of microarray technology to broadly characterize a number of processes implicated in asthma. Given that bronchial tissues are a primary site for airway inflammation and remodeling in asthmatic subjects , we selected this tissue to characterize gene expression patterns in order to identify genes implicated in the pathogenesis of asthma and possibly suggest novel susceptibility genes. We also compared gene expression profiles from bronchial tissues obtained from asthmatic subjects before and following treatment with inhaled corticosteroids (ICS). These studies identified 79 genes of known function that are differently expressed in asthmatics compared to control subjects. Twenty-two genes have an association with asthma reported in at least one publication (although many of these have not been replicated), and 18 have a biological relevance in asthma pathophysiology. ICS treatment partially or completely corrected the expression of 26 of these genes (33%). We optimized RNA extraction methods from bronchial biopsies, which led to the routine generation of high-quality RNA from each new set of tissues and allowed collection of >5 μg of total RNA from a pool of 8 bronchial biopsy cores. 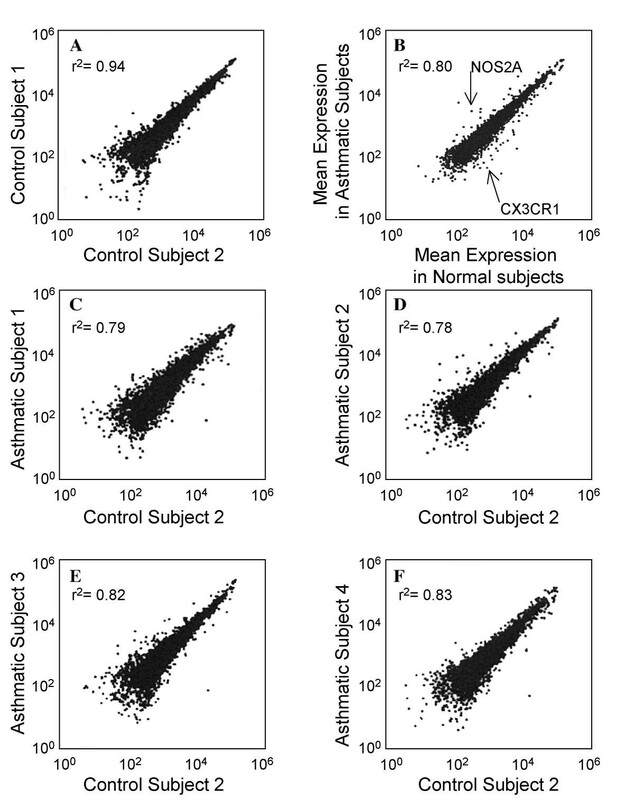 The variability of expression profiles in bronchial biopsies was assessed by comparing expression profiles obtained from control subjects to each other (figure 1A, r2 = 0.94 and data not shown). The high inter-individual correlation among control samples demonstrates that a pool of 8 bronchial biopsy cores provides a reproducible sample of the large airways, and that gene expression measurements are similar in control subjects. In contrast, comparisons of mean gene expression in asthmatic and control groups (Figure 1B) as well as between individual asthmatic and control patients (Figures 1C to 1F) reflect significant differences between these study groups. Compared to figure 1A, the smaller correlation coefficients observed in these comparisons (average r2 = 0.81 for individual patients) demonstrate the greater variability of gene expression between the two groups than among control subjects. Expression levels were measured for each of 12,000 genes on the Affymetrix U95Av2 GeneChip. Expression levels are shown for 5800 genes that were detected in the biopsies used in this study. A. Scatter diagrams comparing the RNA expression profiles obtained from two control women (r2 = 0.94). B. Scatter diagram showing mean RNA expression profiles for asthmatic and control subjects (r2 = 0.80). The mean expression levels for NOS2A and CX3CR1, two genes that are differentially expressed between the two groups, are indicated (see also Table 1 [see Additional file 1]). C to F. Scatter diagrams comparing the RNA expression profile obtained from a normal female to expression profiles obtained from each female asthmatic subject. Of the 12,000 oligonucleotide probe pair sets contained on the U95Av2 chip used in this study, 5,800 probe sets were reliably detected in all bronchial biopsy pools obtained from asthmatic and control subjects (raw data presented in Table 1 [see Additional file 1]). 79 genes (92 transcripts) had significantly different expression levels (Bonferroni cutoff was p < 6.6 × 10-6, corresponding to a single test p < 0.05) between the control and asthmatic groups; 74 of these 79 genes were grouped in 12 functional categories (Table 1 [see Additional file 1]). An additional thirteen transcripts, including genes and ESTs, were differentially expressed but could not be functionally classified. Of the genes that were either up- (20) or down- (54) regulated in asthmatic compared to control subjects, 13 were related to immune signaling molecules, 8 to extracellular proteins, 9 to immune response, 9 to intracellular signaling component pathways, 8 to proteolytic enzymes and 5 to transmembrane proteins. Other genes were notably related to cell growth and proliferation (5), cell adhesion (2), gene transcription (5) and free radical metabolism (4). Many of these 74 identified genes are already known to be modified in asthma i.e. NOS2A, GPX3, TCRα and several proteolytic enzymes, but others are newly implicated in asthma pathogenesis such as ALOX15, CTSC, and CX3CR1. According to the Chronolog recordings, the asthmatics took respectively 24, 41, 48 and 50 ICS puffs of acceptable quality over the 28 day-treatment period. This treatment induced many changes in gene expression in the four asthmatics, normalizing the expression of 21 genes whose expression was modified in asthma compared to control including NOS2A (Figure 2). Indeed, the comparison of post-ICS asthmatic and control subjects' data showed similar expression of these 21 genes (data not shown). However, ICS treatment further decreased the expression of 4 genes whose expression was already decreased in asthma (Table 1 [see Additional file 1]). Fifty-two genes were not modified by ICS treatment as shown for CX3CR1 in figure 2B. Furthermore, the comparison of asthmatic subjects pre- and post-ICS treatment revealed a difference of expression for 128 genes [see Additional file 1]. The transcriptional response to ICS treatment differs significantly for different functional classes of proteins (Figure 3). As discussed above, asthmatic subjects overexpress several proteolytic enzymes in comparison to control subjects: ICS therapy effectively returns the expression of these genes to baseline values (Figure 3A). Similarly, asthma-associated changes in expression of genes involved in immune signalling as well as extracellular proteins are reversed in some cases (Figure 3B,3C). In contrast, ICS have variable effects on the changes in expression of genes implicated in intracellular signalling pathways: in some cases, asthma-associated changes in gene expression are augmented by ICS therapy (Figure 3D). Of interest, many of the differences in gene expression seen between ICS-treated asthmatic and control patients have been previously described in mouse models of allergic airways disease . 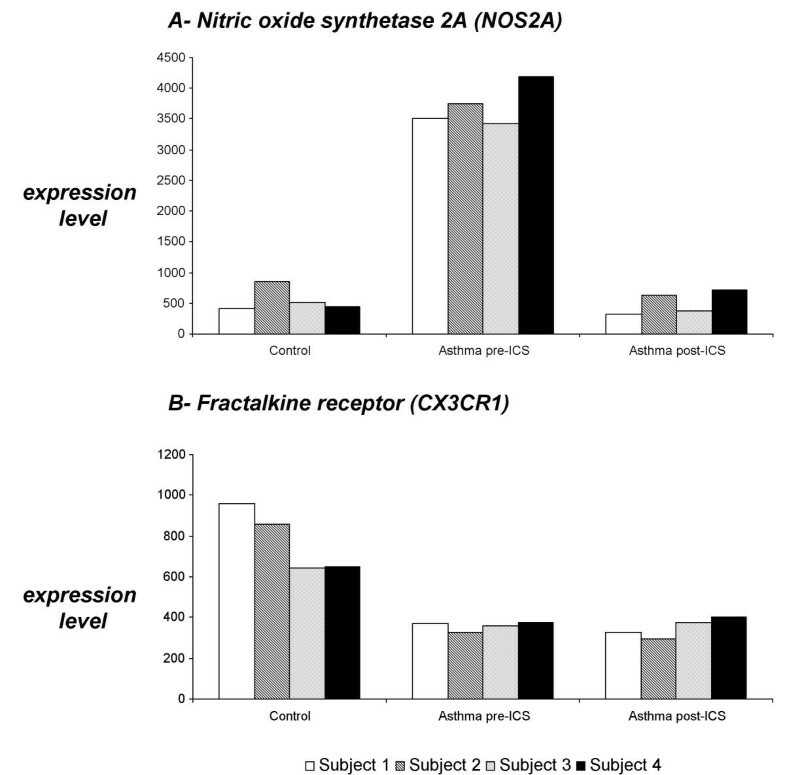 NOS2A (A) and CX3CR1 (B) expression measured in the four analysed asthmatic samples. At baseline (pre-ICS), the expression of NOS2A is increased but the expression of CX3CR1 is decreased. ICS treatment normalizes asthmatics' expression of NOS2A but does not modify CX3CR1 levels. Transcriptional response to ICS treatment. The transcriptional response to ICS differs significantly for different functional classes of proteins. Asthmatic patients overexpress several proteolytic enzymes in comparison to control subjects (D): ICS treatment returns the expression of these genes to baseline values. 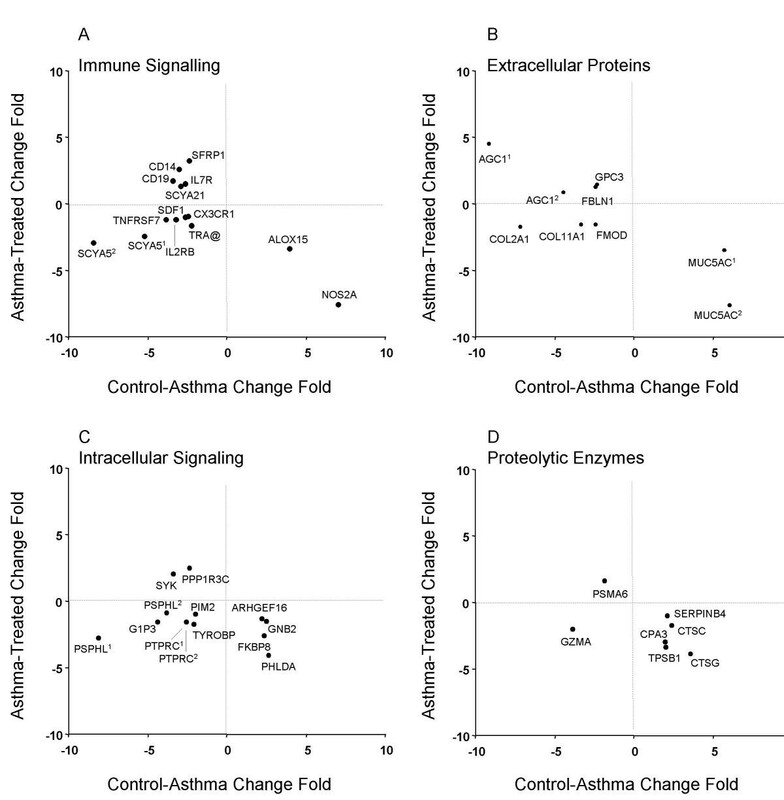 Asthma-associated changes in gene expression involved in immune signaling (A) as well as extracellular proteins (B) are reversed in some cases. ICS treatment has variable effect on the changes in expression of genes implicated in intracellular signaling pathways (C); in some cases, asthma-associated changes in gene expression are augmented by ICS therapy. This is the first global expression study of bronchial tissue that allows the characterization of asthmatic airway phenotypes in comparison with normal gene expression pattern. The data illustrate that microarray studies to detect differentially regulated genes in bronchial biopsies of asthmatic patients identify genes known to be modulated in asthma and following corticosteroid therapy. These genes may provide an excellent set of candidates to further explore the biologic pathways involved in asthma susceptibility and to better understand the true impact of first-line therapy offered to asthmatic subjects following ATS and Canadian recommendations . Because of practical issues related to recruitment of subjects for bronchoscopy, this study includes a modest number of subjects and unequal numbers of men and women in each group. There is no firm standard as regards the optimal number of replicates required for any expression study. This number depends on the source of the RNA material (heterogeneity versus homogeneity of tissue sources) or on the intrinsic properties of each gene on the array (copy number, amplitude of baseline fluctuations) . Four replicates for each biological state were included in each group. The reproducibility of gene expression in each group demonstrates a correlation similar to results obtained by Novak et al. when comparing tissues in two mice from the same litter . Paired bronchoscopy, paired RNA extraction and microarray analysis, and stringent statistical analyses developed for microarrays were also used to improve the strength of the comparison. Application of this technology for studying gene expression profiles from bronchial biopsy samples may also be limited by differences in cellular composition due to differing proportions of epithelial cells, fibroblasts, and smooth muscle cells that may occur in asthmatic and control tissue as a result of biopsy techniques. Indeed, less epithelium has been observed on asthmatic bronchoscope bronchial biopsies , and the biopsy technique may sample deeper in the control bronchial mucosa as it has no edema, no inflammatory infiltrate, and neither mucous gland nor smooth muscle hyperplasia. Consequently, it is impossible to ensure, even in the most carefully executed experiments, that samples originating from the exact same tissue will bear the same cellular composition. RNA samples obtained from bronchial tissues will reflect differences in relative amounts of different cell type compositions. The expression levels of certain transcripts, including RANTES, aggrecan, collagen type 11, and fibromodulin, may reflect smaller amounts of epithelium and greater amounts of cartilage in biopsy specimens of control subjects compared to those of asthmatics. Other gene expression discrepancies may also be due to cell proliferation and recruitment in bronchial mucosa as part of the pathogenesis of asthma. The application of gene expression technology may be limited by the disease's spatial and temporal heterogeneity. In asthma, the airway mucosal inflammatory/remodelling process is diffuse, thus reducing such possibility in the present study. Moreover, although certain features – such as the degree of eosinophil infiltratation – are more intense in small airways , airway inflammation is not a patchy disease, even in very mild asthma . In our previous experiments, inflammatory and remodelling features were present in each biopsy obtained from asthmatic subjects. Since physiopathological alterations are uniformly spread throughout the airways , we can therefore assume that random biopsies are fairly representative of the entire lung. Asthma is a chronic disease, and inflammatory and remodelling features remain quite similar in stable disease . After using stringent tests for determining significance (see Methods), a very small fraction of the 5,800 transcripts detected in bronchial biopsies showed differences in expression levels between the control and asthmatic groups. Since this study shows significant modifications with a small number of subjects, the 74 identified genes likely include those with the most persistent and possibly the greatest alterations. Interestingly, the list of modified genes included more genes with decreased as opposed to increased expression. Moreover, our study has identified overexpression of rather few genes coding for inflammatory mediators in asthmatic subjects. However, the inclusion of more subjects in each group will increase the statistical power and, consequently, the number of significantly modified genes and very likely the number of modified inflammatory genes. The observed increased expression of some genes, including nitric oxide synthase 2A [18–21], CD14 antigen , T cell receptor alpha locus , small inducible cytokine A5 (RANTES) , mucin [25, 26], tryptases [27, 28], cathepsin C , and possibly glutathione peroxidase 3 , spleen tyrosine kinase , and also cathepsin G , a serine protease, matches previously published results and confirms the implication of candidate genes already associated with asthma in previous studies. On the other hand, the expression level of other genes is lower in bronchial tissues of asthmatic subjects. The lower glutathione peroxidase, an important antioxidant enzyme, in tissues of asthmatic subjects confirms observations of Misso et al., who reported a reduction in the activity of glutathione peroxidase in asthma . The fractalkine receptor (CX3CR1) showed expression levels that are increased by two-fold in bronchial tissues of subjects with normal pulmonary function in comparison with asthmatic subjects. Fractalkine is a membrane-bound chemokine expressed by endothelial cells of lungs and is possibly involved in asthma pathogenesis . Although there are limited data available on the fractalkine receptor's role, some studies reveal that fractalkine is pro-Th1, which could explain its higher expression level among normo-reactive subjects. The SCYA21 gene codes for the secondary lymphoid-tissue (SLC) chemokine that, similarly to fractalkine, is chemotactic for lymphocytes . These and other genes, such as glypican 3 and fibulin 1, may also be important in asthma pathogenesis and need to be validated by association studies, in situ hybridization and immunohistochemistry. Another objective of this study was to evaluate the effect of corticosteroid therapy on the expression level of genes, more specifically on genes differentially expressed among control and asthmatic subjects. This objective was based on the hypothesis that expression disparities observed in bronchial tissues of asthmatic subjects vs. healthy subjects are mainly due to asthma physiopathology, and that genes whose expression is modulated (up-regulated or down-regulated) following therapy are involved in ICS action mechanisms. The cumulative number of fluticasone 250 μg puffs in each subject, even the less compliant one, over the 28-day treatment, likely reached the dose required for near optimal ICS effects on inflammatory/remodeling processes present in the bronchi of subjects with mild asthma . ICS had variable effects on gene expression. They normalized some genes, including NOS2A as previously reported . The reasons for ICS-induced decreases in T cell receptor beta locus and TYRO protein tyrosine kinase binding protein remain undefined. Most asthma-related genes seen in the asthma-to-control comparisons (70%) remained unchanged after therapy. Since ICS do not heal asthma, it is possible that some of these genes are responsible for asthma chronicity. Undeniably, the results obtained using microarrays need to be validated with other techniques (for example in situ hybridization and immunohistochemistry should permit a better definition of specific cell types implicated in differences in gene expression). Nevertheless, this study shows that bronchial biopsies obtained from healthy and asthmatic subjects display distinct expression profiles. These differences provide a global view of physiopathologic processes active in the asthmatic lung and may provide invaluable help to clarify the natural history of asthma. Similar strategies may be extended to other asthma phenotypes, such as more severe asthma, that are associated with the highest morbidity and mortality. It may allow us to define changes in expression of genes of particular pathophysiologic or therapeutic interest, which in turn may lead to more appropriate therapeutic interventions for patients. Four healthy subjects (2 men and 2 women) without a history of allergy or asthma and four asthmatics (all women) meeting the criteria of the American Thoracic Society for the diagnosis of asthma were recruited to the study . The inclusion criteria included a stable treatment for more than 3 months, no ICS therapy for at least 3 months preceding the study, no use of other drugs, and no disease other than asthma. All subjects were non-smokers and had not had respiratory infection within the last 2 months. Forced expiratory volume in one second (FEV1) values and the dose of methacholine that resulted in a 20% fall in FEV1, corresponding to the PC20, were measured in the morning, at least 8 h after any β2-agonist inhalation. Control subjects had normal PC20 methacholine (≥16 mg/ml), negative skin prick tests, no known systemic disease and took no medications. Asthmatic subjects had PC20 < 8 mg/ml, a morning prebronchodilator FEV1 ≥ 85% of the predicted value and required only a short acting β2-agonist on demand less than 4 times a week. In addition, all asthmatics had atopy symptoms and positive prick skin tests. The patient characteristics are summarized in Table 2: all had mild asthma according to criteria of the Canadian Asthma Consensus Report . The four asthmatic subjects agreed to take fluticasone MDI 250 μg (Flovent®) with an aero-spacer, one puff twice a day for a period of 28 days, and to have a second bronchoscopy with bronchial biopsies at the end of the treatment. The compliance of the subjects to ICS was evaluated with a Chronolog (Medtrac) that registered time of MDI actuation and quality of inhalation. The post-treatment bronchoscopy was performed between 1 and 6 months after the initial study. Approval for the study was obtained from ethics committee at Laval Hospital. All subjects provided informed consent. * Forced vital capacity (FVC) and pre-bronchodilator forced expiratory volume in one second (FEV1) expressed in liter and (%) of predicted. † Concentration of methacholine inducing a 20% fall in FEV1. ‡ Skin response read at 10 min if mean wheal diameter ≥ 3 mm; C: cat, D: dog, DPt: D. Pteronyssinus, Du: dust, G: grass pollens, M: mold, Rw: ragweed, T: tree pollens. A wheal response to histamine ≥ 3 mm served as a positive control. Bronchoscopies and bronchial biopsies were performed for paired control and asthmatic subjects on the same morning. After local anesthesia was provided using 2% and 4% xylocaine, the flexible fiberoptic bronchoscope (Olympus P200) was introduced into the bronchial tree. Eight biopsies evaluated as acceptable by the research assistant were taken from bronchi of the right lung using alligator forceps (Olympus FB-15C-1). Biopsies were obtained from the sub-segmental and segmental bronchial carinae of the lower (3–5 biopsies) and upper (1–2 biopsies) lobes, as well as the lobar carinae of the middle (2 biopsies) and upper (1–2 biopsies) lobes to provide adequate samples of the large airways (3rd to 5th bronchial generation). When bronchoscopy was repeated after ICS treatment, biopsies were taken from the left lung at similar bronchial levels. Bronchoscopies were performed under oxygen at 2–3 l/minute by nasal catheter. Vital signs, electrocardiograph output and oximetry were recorded throughout the procedure. The biopsies were processed and RNAs extracted in parallel the same day. The tissue samples were immediately placed in RNAlater (Ambion) to stabilize intracellular RNA during transport. The samples were mechanically homogenized (Rotor/Stator homogeniser, PowerGen) and total RNA was extracted using the RNEasy kit (Qiagen) according to the manufacturer's instructions. RNA integrity and yield was assessed using Agilent BioAnalyser RNA LabChips® and by spectrophotometry. Microarray expression studies were performed using Affymetrix HG-U95Av2 GeneChips (Affymetrix, Santa Clara, CA). These arrays contain 12,000 probe sets derived from sequence clusters contained in Build 95 of Unigene, which represent approximately 9,200 unique Unigene sequence clusters including 6,000 functionally annotated genes as well as expressed sequence tags (ESTs). To minimize technical variability, RNA processing steps (RNA extraction, probe labelling and chip hybridization) were performed in parallel for control and asthmatic samples. Probes for microarray analysis were prepared using 5 μg of total RNA. A single expression array was hybridized for each RNA sample. Following washing, the specifically bound probe was detected by incubating the arrays with SAPE (streptavidin phycoerthryin, Molecular Probes) and scanning the chips using a Gene Array Scanner (Agilent). The scanned images were analyzed using the Microarray Analysis Suite 5.0 (MAS5, Affymetrix). Detailed probe synthesis hybridization and washing protocols have been previously described . In total, biopsies from four patients were obtained in each sample group (control, asthmatic pre-ICS and asthmatic post-ICS). Data was extracted using MAS5 and filtered to exclude genes that were not expressed (taken to be equivalent to a MAS5 absent call) in all samples. The ArrayStat microarray analysis package (Imaging Research Inc., St. Catharines, Ontario) was used to identify significant differences in gene expression by performing pairwise comparisons of microarray results obtained for each subject group. ArrayStat estimates variance in gene expression using a local pooled error model and implements the Bonferroni correction for multiple testing. Functional classification was performed using the Gene Microarray Pathway Profiler (GenMAPP) . The raw data is available from the NCBI Gene Expression Omnibus http://www.ncbi.nlm.nih.gov/geo/. This work was supported by the Réseau en santé respiratoire du Fonds de la recherche en santé du Québec, by Génome Québec and by the Burroughs Wellcome Fund. The authors thank Luce Trépanier for her invaluable help in recruiting and evaluating the subjects for the study and Rachel Lavallée and Suzanne Leclerc for their help in performing bronchoscopies. The members of the Génome Québec microarray are thanked for their technical help in processing the bronchial samples used in this project. C.L. is supported by the Fonds de la recherche en santé du Québec. T.J.H. is supported by a Clinician-Scientist Award in Translational Research by the Burroughs Wellcome Fund and an Investigator Award from the Canadian Institutes of Health Research. C.L. co-conceived the study, and participated in its design, statistical analysis, coordination and drafted the manuscript. R.S. participated in the design of the study, performed the statistical analysis and contributed to the manuscript. A.P. coordinated the chip laboratory. M.C.B. carried out the RNA extraction from the bronchial tissue. T.J.H. participated in the design of the study and contributed to the manuscript. M.L. co-conceived the study, participated in its design, directed the recruitment and the clinical evaluation of subjects, realized bronchial biopsies and participated to the manuscript redaction. All authors read and approved the final manuscript.